December 6 – December 14. Panarama of Cambridge Cay. Bell Rock is the big bump sticking out of the water in the middle of the pic. **This picture can be enlarged by clicking on it on the website. Then click the back button in your browser to get back to the blog. 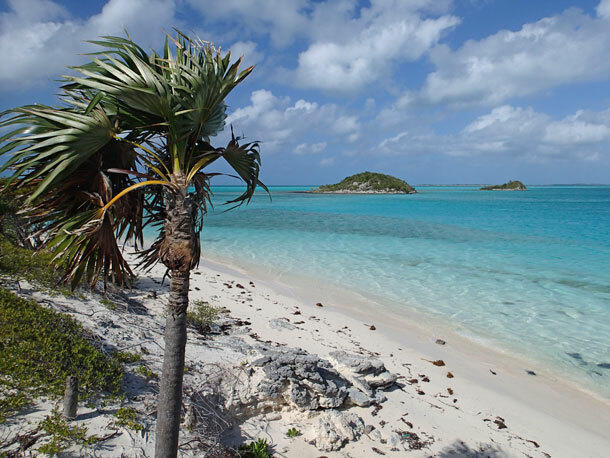 Our plan this season is to head south, island hopping through the Exumas to Long Island. From there we hope to make short trips (two or three weeks) to some of the more remote southern out islands. We are looking at the Jumentos Cays, a long string of little spits of land extending down almost to Cuba. We have read and have heard from other sailors that the good anchorages are few and you need to be very self sufficient since the only town (the only place to get food, maybe water, no fuel) is Duncan Town on Ragged Island, at the very southern end of the chain. 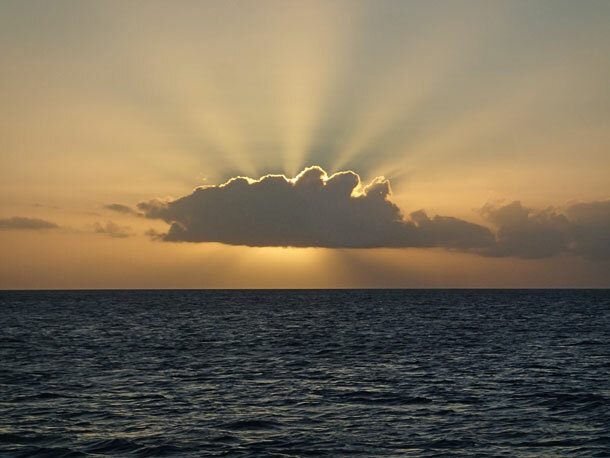 We also have our sights set on the Acklins and Crooked Island cays. Although we are limited in our anchorages and where and when we can travel due the shallow water, there are pink flamingoes there — and I want to see them. From West Bay we had one more big jump to make before our southward journey could take on a more leisurely pace. 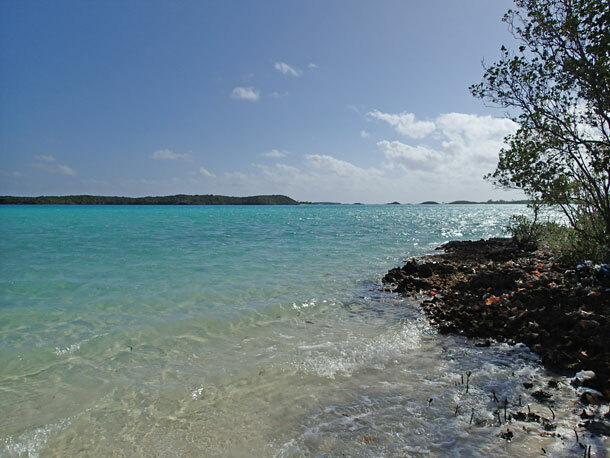 We left New Providence early Friday morning, December the 6th, for a 50+ mile trip to the Exumas. The forecasted wind was good for sailing, although it was not in a favorable direction. 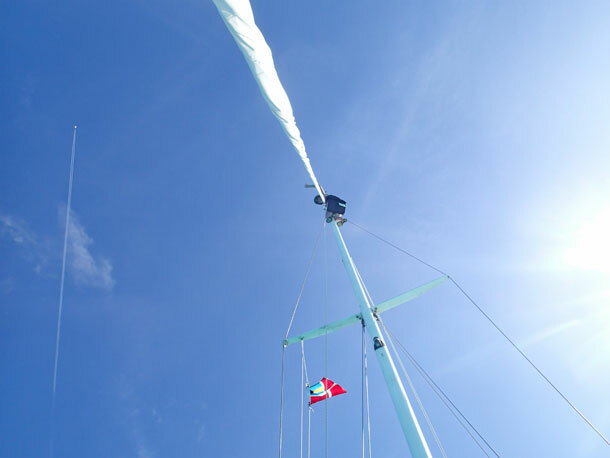 But by noon we realize the prediction was a little off and the wind was not worth trying to sail in if we wanted to get anywhere before the morning, so we rolled up the jib and motored across the Great Exuma Bank. We arrived at Highbourne Cay in the dark about 8pm. Our expected wind might have come about sundown, but it was hard to tell because our wind gauge quit working along the way. We spent the next day on Blue Wing doing a little R’n’R (rest and repairs). Sunday we continued south to Norman’s Cay. One of the paths from the road led to the interior of the Norman’s Cay and this view of Norman’s Pond. Pretty view at the top of Norman’s Cay. The weather report was predicting a front, so we set out to move to a better location for protection from any potential strong west wind. 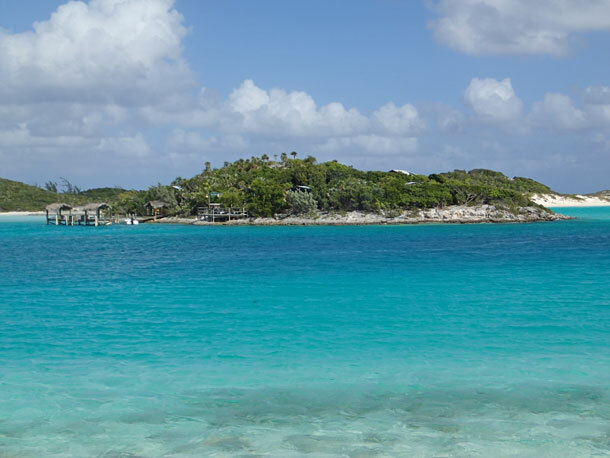 On Tuesday we crossed the boundary into the Exuma Cays Land and Sea Park and sailed down to Shroud Cay. After a night at Shroud we continued south to Cambridge Cay where we would sit out the front. Cambridge is one of those anchorages with a strong current running through it. Usually Blue Wing points into the wind when on the hook, but at Cambridge she points with the flow of water, changing orientation with the ebbing and rising of the tides. It is mostly a pleasant experience and only just a little disconcerting as you hear the grinding sound of the anchor chain scraping along the bottom of the sea floor when the tide changes in the middle of the night. 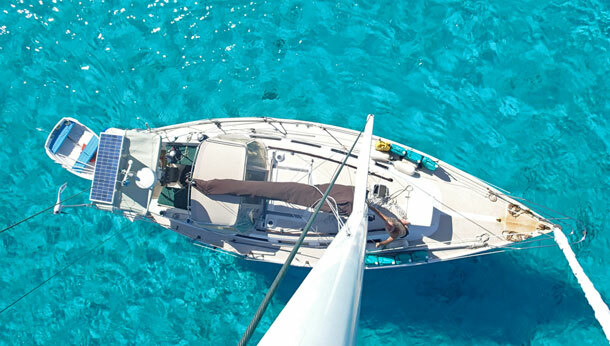 Current is something we learned little about in our sailing classes, but have realized since we have been navigating the waters of the Bahamas that itâ€™s something we really need to pay attention to. Getting into the anchorage at Cambridge involves traversing a shallow, narrow, and windy channel, which is a challenge we would normally take very slowly, but add in the current it becomes a white knuckle event. At the helm I carefully followed the zigzagging way points Greg had programmed into the GPS, keeping an eye on our depth, and throttling up through the pull of the current wanting to push us into the shoal. Cambridge is another island we spent quite a bit of time at last year, so with the desire to do something new I thought I’d climb Bell Rock. Greg climbed the rock last year, but the 50 feet high, vertical challenge looked a little daunting to me, so I passed. This year, though, I have decided not to be intimidated by strong current or very large steep structures. In order to get to the rock one first needs to wade through the water that surges around either side of it, so I timed my ascent to coincide with low tide. Getting on to the base of the rock was easy, but deciding where to continue on up to the top was more of a challenge. I finally decided to traverse the scarier, but more suited to my short legs, route, up a narrow steep path winding over an edge of the rock. 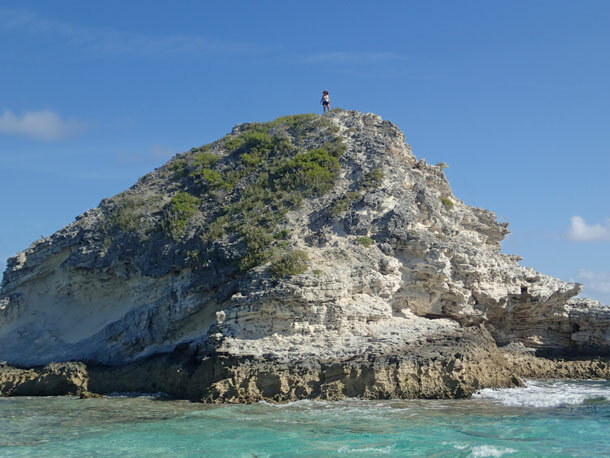 Despite my desire to climb, I think humans are ill designed for this type of activity and I often wish I had four much shorter legs and claws when exploring the rocky expanses of the Bahamas. I made it to the top without a hitch. The view was stunning. We spent a couple of days at Cambridge on the boat doing more repairs and general maintenance, before we faced the current again and motored out the shallow windy channel to continue our journey south. At the base of Bell Rock deciding the best way to get to the top. The second time Duwan gets high in one day — A view from the top of the mast. Greg wenched me up to fix the halyard that was preventing the job from unfurling. 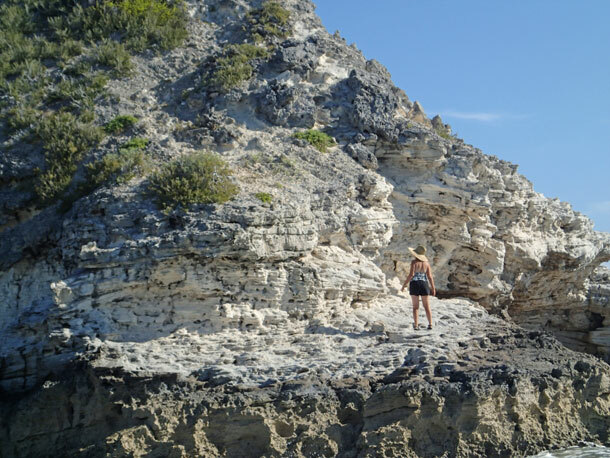 This entry was posted in Life on the Water, The Bahamas, The Exumas and tagged Bell Rock, Cambridge Cay, Exuma Cays Land & Sea Park, Island Hike, Island World, Norman's Cay, Norman's Pond, Saddle Cat Cut, The Bahamas, The Exumas, Up The Mast. Bookmark the permalink.